At Dynamic Smile Design, we offer a variety of different dental procedures. We want to give each of our patients the best care possible. We realize that each patient is different, and so we provide many options and work to individualize and personalize the care we give to each patient. If you have missing teeth, you might be wondering what your options are for replacing teeth. There are many people who are missing teeth for one reason or another, and, if you are one of these people, you might wonder what your options are. At our office, we provide a variety of different choices for teeth replacement procedures. Dental implants are the closest option to replicating your actual teeth. The implant is placed surgically into the upper or lower jaw. The implant takes a while to heal, but they are very strong since the bone in the jaw grows around the implant and anchors it in place. 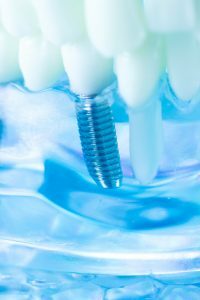 After the implant placement is done and healed, we create a custom crown, bridge, or denture to connect with the implant. Our office also provides many restorative dentistry options. Tooth colored fillings: These fillings are made of a tooth colored composite that is used to fill cavities and replace old fillings. Porcelain Crowns: This procedure is used to fix cracked or damaged teeth. The porcelain crowns can also be used as part of the dental implant procedure. Gold restorations: For patients with sensitive teeth, a gold restoration can work great. These are strong and durable and generally used on back molars. Dentures: Dentures are used when multiple teeth are missing. Partial dentures can also be used to replace missing teeth and are created with materials that match your remaining teeth. Fixed bridges: A bridge “bridges” the gap created by missing teeth. Bridges are placed in the mouth by a variety of methods. Bridges can be used to replace a single missing tooth or a few teeth in a row. To learn more about these procedures, give Dynamic Smile Design a call. We are happy to help you learn more or to schedule your appointment at a time that works best for you. Dr. Puig also offers consultations where you will be able to work out the best option for you to replace your missing teeth.